Bay leaf or bay laurel (Laurus nobilis) is an aromatic herb whose origin dates back to antiquity. In addition to its primary culinary use, it holds medicinal properties. The leaves are boiled to make tea to help relieve bloating, flatulence, heartburn pain, gastritis discomfort and regulate digestion. In the past, the crushed or boiled leaves were applied as a poultice on the skin to help heal wounds and prevent infection. Bay leaf essential oil is used for relieving arthritis-related joint pain and employed in aromatherapy for stress relief. But the most impressive are the benefits of bay leaves for diabetes management. The tea and the finely ground leaves especially reduce blood sugar and improve cholesterol numbers in type 2 diabetes patients, among other benefits specifically for the condition. 1) Finely ground bay leaves have been used as dietary supplements for blood sugar management, better insulin control and to improve cholesterol profiles in diabetics. 2) Bay leaf tea made from boiled bay leaves, usually dried, whole or finely ground, is known to have been used internally for high blood sugar. Outside of the range of diabetes-related health issues, it is recognized for its digestive benefits (bloating, flatulence, colic, stomach acidity, heartburn pain). 3) Bay leaf oil (laurel oil) is used externally for joint and muscle pain and to help heal wounds and prevent infection (the essential oils hold valuable anti-inflammatory, antibacterial and antifungal properties which could be applicable to diabetic skin health). 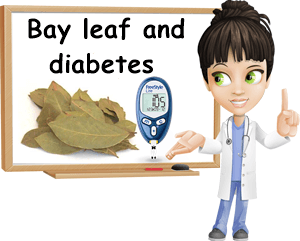 Probably one of the biggest benefits of bay leaves for diabetes is their ability to effectively lower blood sugar levels in diabetics, contributing to better insulin control and management of the metabolic condition. In a study called Bay Leaves Improve Glucose and Lipid Profile of People with Type 2 Diabetes, by Alam Khan, Goher Zaman, and Richard A. Anderson, 3 groups of type 2 diabetes patients (10 persons per group) received ground bay leaves in capsule form in doses of 1, 2 and 3 g a day (intake was split into two doses, one in the morning and one in the evening, after breakfast and after dinner, respectively). Results were compared to those of a placebo group of 10 type 2 diabetes patients. The experiment saw the administration of bay leaves or placebo for 30 days, followed by a 10-day wash out period. What the study showed was that taking ground bay leaves for diabetes helped lower fasting blood sugar levels by 21 to 26%. Effects were pregnant even in the group taking the lowest amount of bay leaves (1 g a day), were confirmed after as little as 10 days in the groups taking 1 and 3 g of ground bay leaves and after the 10-day wash-out period in the same two groups. By comparison, the placebo group did not see any significant changes in blood sugar levels. All subjects were also on medication for their condition, but not on insulin. In addition to its blood sugar-lowering effects, bay leaves have been found to lower total cholesterol and LDL (low-density lipoprotein, or bad) cholesterol and triglyceride levels. Cholesterol levels dropped by 21 to 24% in the all the groups taking ground bay leaf capsules, whether it was 1, 2 or 3 g a day. LDL (bad) cholesterol dropped the most. This is an important benefit bay leaves bring to diabetic health since cardiovascular disease is the most common and often severe complication of diabetes. Lauric acid is a saturated fatty acid found in bay leaves and in bay leaf oil (also called laurel oil). Lauric acid actively contributes to cardiovascular health in diabetic patients by raising HDL (high-density lipoprotein, or good) cholesterol levels. Sufficiently high HDL levels hold several benefits such as helping prevent LDL (bad) cholesterol oxidation, exerting an anti-inflammatory effect on blood vessels and protecting against atherosclerotic changes to the interior lining of blood vessels that could encourage thrombotic events such as a stroke or myocardial infarction. If you’re diabetic and looking to improve your cardiovascular health, know that both healthy total cholesterol numbers and a healthy cholesterol profile (HDL vs LDL) are the pillars of vascular health. Bay leaves and bay leaf oil exert an anti-inflammatory action on blood vessels thanks to the saturated fat called lauric acid (the leaves have quite little of it overall, but the oil is higher in it). This saturated fat makes the good HDL cholesterol go up and this provides anti-inflammatory benefits for the vascular system. Effects such as improved blood sugar and blood lipid metabolism contribute to overall reduced inflammation levels which benefits diabetic health. Aromatic oils that give bay leaves their particular flavor as well as antioxidant polyphenols in the leaves hold anti-inflammatory, antibacterial and antifungal activity which explains the use of boiled bay leaves for the treatment of wounds and various skin ailments and preventing infection. Bay leaves contain cineol, alpha-pinene, beta-pinene, myrcene, limonene, linalool, methyl chavicol, neral, alpha-terpineol, geranyl acetate and eugenol, all aromatic oils with wound-healing properties. The leaves further contain zinc, a mineral with antimicrobial and immune system-boosting action and vitamin C, known for its antioxidant, anti-inflammatory and antibacterial properties. In the past, bay leaves would be boiled or crushed and applied to wounds. The water in which they were boiled would also be used to soak cloths for wound dressing. But do bay leaves cure diabetes? No, bay leaves are not known to cure diabetes. They do have benefits for diabetes, such as reduced fasting blood sugar and improved insulin control as well as benefits for the cardiovascular system, an important aspect of diabetic health, but do not actually (or completely) cure the metabolic condition, not by themselves anyway. Diabetes is a fairly complex disease, one which requires a multifaceted approach that considers nutrition and lifestyle aspects. Treating it relies on a combination of therapies, medication and lifestyle and dietary changes that seek to minimize risk factors whilst addressing the core causes.